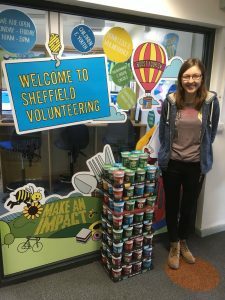 Grantham Scholar Emma K. Smith has been part of a project that collects pot noodles for homeless people in Sheffield. This last week the Grantham centre staff and scholars have collected donations of pot noodles for the Cathedral Archer Project (@archerproject), a charity that specialises in helping the homeless. This action was instigated by Sheffield Volunteering (@Shef_Volunteer) as part of their ‘Take Action on Homelessness’ week, which also happened to coincide with snow and bitterly cold gusts of up to 60 mph. The weather cancelled many events around the university including the talk: How can I help people on the street? Fortunately, you can find the answer to this question on the Sheffield Volunteering website and further information on the Help Us Help website. Crucially, you can make the biggest difference by donating to charities who provide expert support to people who beg, giving your time as a volunteer and spreading the word to help other people think about how they respond to street begging. Why pot noodles? Because rough sleepers can access hot water, allowing them a hot meal on the streets. It’s a cheap and easy way to make a huge difference to someone’s day. Sheffield Volunteering collected over 200 pot noodles over the course of one week (26th Feb – 4th March) with the Grantham Centre’s contribution totalling 100 pot noodles. You can find out how to further support the Cathedral Archer Project via their website showing what they are currently running out of and where to drop them off.